The son of Cambodia’s long-serving prime minister was promoted to two senior military posts on Saturday as his father looks to widen his family’s influence. The move comes just weeks before elections that veteran Cambodian leader Hun Sen is expected to easily win given the main opposition party has been dissolved. Hun Sen, who has ruled for 33 years, is accused of trying to build a political dynasty by priming his three sons for top posts. On Saturday his eldest son Lieutenant general Hun Manet was promoted to acting chief of joint staff and commander of the army headquarters, according to defense ministry spokesman Chhum Socheat. The 40-year-old West Point trained officer will keep his current roles as head of the defence ministry’s anti-terrorism unit and the deputy commander of Hun Sen’s personal bodyguard unit. He will soon be promoted to a four-star general, a required status for the jobs. The defence spokesman said Hun Manet’s promotion was merit-based and not because of his family name. 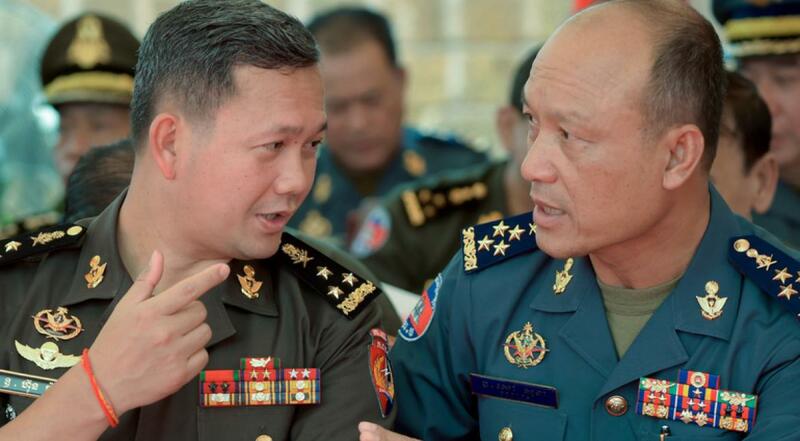 “There is nothing strange, his promotions have been made based on his qualifications and experience in the army,” Chhum Socheat told AFP Saturday. Several others were moved in the military shuffle, including military police commander-in-chief Sao Sokha who was appointed acting supreme commander of the Royal Cambodian Armed Forces. Two othersPol Saroeun and Kun Kimstepped down from their senior military roles to run for parliament in the July 29 vote. Both are close allies of Hun Sen and were among 12 generals accused in a Human Rights Watch report this week of carrying out rights abuses, war crimes and crimes against humanity for decades to prop up Hun Sen.
“These 12 men are the backbone of an abusive and authoritarian political regime over which an increasingly dictatorial Hun Sen rules,” the reports said. They were accused of “violations of human rights, war crimes, and crimes against humanity committed from the 1970s to the present,” it said. The Cambodian ministry of defense denied the HRW’s allegations, calling it a “deranged report”. Hun Sen’s second son Hun Manit is the head of a powerful military intelligence unit and his youngest Hun Many is a parliamentarian who oversees the ruling party’s far-reaching youth movement. One of the world’s longest serving leaders, Hun Sen is seeking to prolong his grip on power in national elections next month. He has paved the way for an almost certain success, dissolving the main opposition tipped to win the year’s ballot. The strongman has been accused of a sweeping crackdown on dissent and several western democracies have withdrawn support for the vote. The 65-year-old premier has repeatedly vowed to stay in office for another decade.